Salem Ind. (June 10, 1990) – Bob Senneker extended his all-time career record to 62 American Speed Association wins by capturing the ASA Challenge Series “Raider 300” at a record 87.468 miles per hour on Sunday at Salem Speedway. 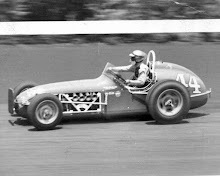 Senneker won his second consecutive race to push his points lead to 67 points over race runner-up Harold Fair. The 17-year ASA veteran snapped the previous ASA record ‘300’ record at Salem by more than 3 minutes, covering the 162 miles in 1 hour, 51 minutes and 7 seconds and edging Fair by three seconds. 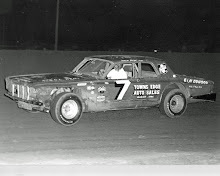 Senneker led the first 97 laps and the last 43 laps for his fourth career ASA win on the famed high-banked paved oval to collect $7,715 in prize money from the $74,220 purse. After pitting early and turning the lead over to Mike Eddy of Midland, Mich., Senneker spent much of the race tracking down teammate Johnny Benson Jr. who led for 123 laps. Fair’s second straight runner-up finish kept him in the 1990 championship picture. Johnny Benson took over third in points and passed Rich Bickle Jr. of Edgerton, Wis., in the chase for top rookie honors. 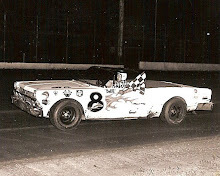 Senneker had plenty of challenges early on and was chased by Eddy, Fair, Bickle and Canada’s Junior Hanley. On lap 135, Bickle, sixth, and Ted Musgrave of Grand Marsh, Wis., eight, were gathered in a four-car crash touched off by Wayne Edwards’ spin on the backstretch. Bickle lost 67 laps while waiting for repairs. Tracy Leslie of Mount Clemens, Mich., the 1988 ARCA national champion, made his ASA debut but dropped out after only 62 circuits due to handling problems. Buckeye 300 winner Gary St. Amant of Columbus, Ohio, finished 14th, trailing by 25 laps. 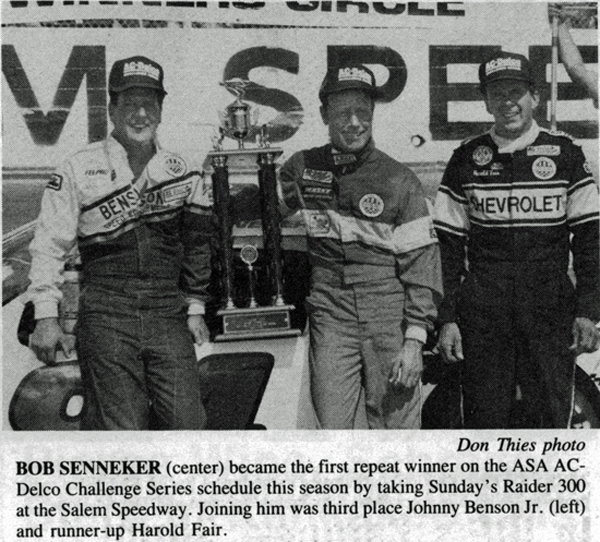 Senneker became the first repeat winner of 1990, ending a string of four different winners. 1. Bob Senneker, Dorr, Mich.
2. Harold Fair, Detroit, Mich.
3. 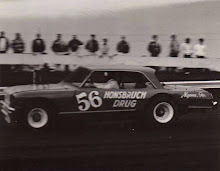 Johnny Benson Jr., Grand Rapids, Mich.
5. Scott Hansen, Green Bay, Wis.
6. 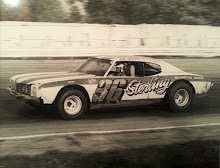 Mike Eddy, Midland, Mich.
8. Tom Jones, Northbrook, Ill.
10. Dennis Vogel, Manitowoc, Wis.
11. John Olson, Stoughton, Wis.
13. Tim Kezman, Franklin, Wis.
16. Steve Burgess, Eau Claire, Wis.
17. Bruce Hidenrite, Owensboro, Ky.
18. Wayne Edwards, Fairdale, Ky.
19. Al Groog, Bluffton, Ind. 20. Rich Bickle Jr., Edgerton, Wis.
21. Scot Walters, Louisville, Ky.
22. Ted Musgrave, Grand Marsh, Wis.
23. Bruce Vanderlaan, Grand Rapids, Mich.
24. Jay Sauter, Necedah, Wis.
25. Jeff Neal, Grayslake, Ill.
27. Tracy Leslie, Mt. Clemens, Mich.
28. Tim Steele, Marne, Mich.
29. Butch Lanum, Woodburn, Ind.